College basketball may lack the star power of the NBA, but it's considered by many to be the purest form of basketball. Several factors draw people to college basketball betting including searching for a solid source of totals markets. For a variety of reasons, NCAA basketball can be a good choice for these types of bets if bettors know what to look for. 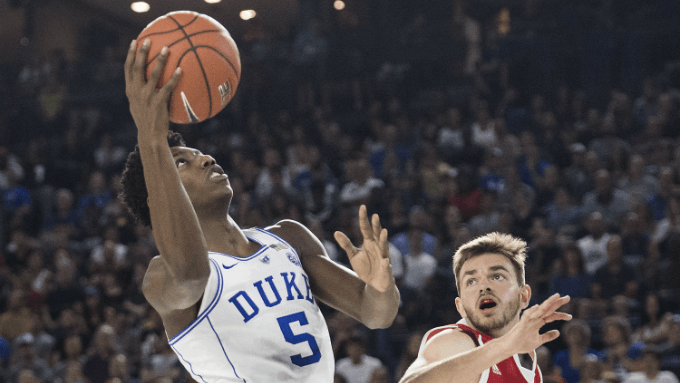 Check out this break down of what to consider when betting over/under markets in NCAA college basketball. College basketball already averages a considerably lower amount of points scored per game than the NBA. NCAA teams (with admittedly an absurdly large sample size) average only 67.7 points per game compared to the NBA’s 101.8 ppg. This is due to several major factors that divide the professional and amateur game. These include the mere facts that NCAA games are eight minutes shorter (at 40 minutes long) than NBA games and that the NCAA shot clock for every possession is six seconds longer than the pros. Obviously there’s the gap in talent as college teams shoot for lower field goal and three-point percentages than the pros. This is largely due to the fact that superstars are scarce in the college game and the cream of the crop have increasingly moved to leave for the NBA draft after just one season. The NCAA only averages around 69.5 possessions per game and teams average just 1.74 per minute. Many college athletes are learning to get the best out of their games and many coaches utilize the longer shot clock to set up well developed plays. Teams that are efficient and methodical with the basketball may score less points per contest, but could be more successful, thus this style of play is popular. In contrast, teams employing Run and Gun play a fast-paced freewheeling style that results in large numbers of field goal attempts. These teams generally shoot earlier in the shot clock and thus score at a higher clip when their offenses. The key part of that tip is “WHEN the offense is on” because while teams that play this style are likely to hit overs, they can also have off nights that frustrate bettors. Teams that play at a fast pace can also make more mistakes when matched against more defensive-minded squads. But while the risk is there, it’s worth playing the percentages at times. Teams that both make free throws at a high clip AND employ Run and Gun are almost always worth an Over bet. As obvious as that sounds, it only is meant to point out the fact that maintaining a knowledge of how certain teams play can be extremely beneficial to betting individual contests. Other coaches employ harsh defensive schemes to dictate the pace of games. Some coaches base entire systems and recruitment of particular players specifically off of defensive fundamentals. Jim Boeheim’s Syracuse teams seem to regularly overperform due to an ugly but effective version of the 2-3 zone. There’s also Bob Huggins’ “Press Virginia” that attempts to smother high caliber offensive squads throughout the Big 12. Ultra defensive basketball may not be the most entertaining brand to watch, but amongst teams that overperform and have deep tournament runs, it’s highly popular. It’s thus important to establish a good understanding of which coaches employ the toughest defensive tactics and consider the under in games involving their programs. The modern NCAA has seen an uptick in the sheer number of fouls called per game at a macro level. Even with that in mind, there are some referees who call fouls differently in certain situations and some who call more on average. Obviously teams that play a more physical brand of basketball may be in line to receive (or surrender) an inordinate amount of trips to the free throw line depending on how closely the referee calls the game. Foul shots obviously absolutely impact the total number of points scored in the contest and with that in mind, it’s important for bettors to check out teams’ overall free throw percentage. There’s nothing more frustrating than betting on a team that gets a lot of free throw opportunities, but clunks attempt after attempt from the charity stripe. Now that you understand betting college basketball over/unders, feel free to check out how it compares to betting NBA over/under bets.